Spring is near and we all crocheters need to hurry and make some awesome Springtime Goodies this year 🙂 so what are you waiting for? 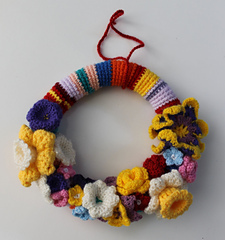 Pull up your socks and make some lovely decorations for your home or gift some beautiful items to your loved ones. 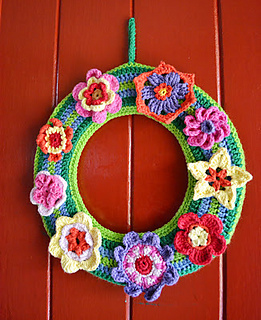 Springtime is all about colours so here we are giving you some awesome Free Crochet Patterns for Spring Wreaths. Be ready to see some colourful images, we have collated some nice patterns for Spring Wreaths, have a look. 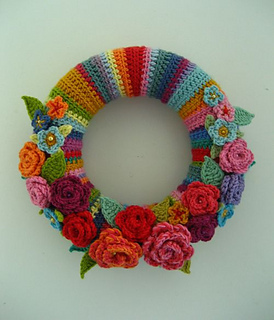 Floral Wreath by Susie Johns is a lovely all flower crochet spring wreath, it is quite simple and looks colourful. We loved it because it is all flowery and feels like spring. 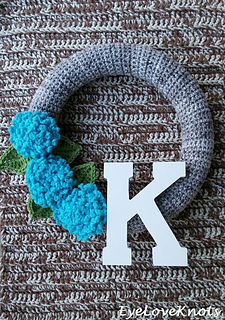 Springtime Wreath by Lucy of Attic24 is a beautiful crochet wreath for springtime that uses UK crochet terms and lovely buttons. Crocheted Spring Wreath by Ioana van Deurzen is a photo tutorial pattern and she has made a lovely colourful wreath using a fiberfill for the main wreath part, flowers are her own designs. Turqua Spring Wreath by Alexandra Richards ELK made using Aran weight yarn and a 5.00mm crochet hook. The colour looks lovely. Also, it looks very simple, so if you are a person who likes to go simple with the decor this one is for you. 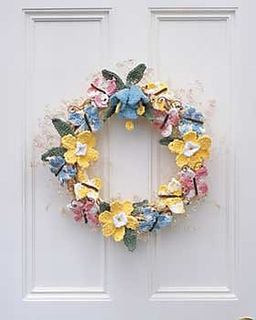 Flowers & Flutterbys Pastel Spring Wreath by Sher Jenkins made using a DK weight yarn, a 3.75mm, and a 3.5mm crochet hook. It is a good wreath to try. Celebrate Spring by Lily / Sugar’n Cream made using a worsted weight yarn and a 4.00mm crochet hook. You can download the free pattern from the link and also get the suggested yarn for this pattern. 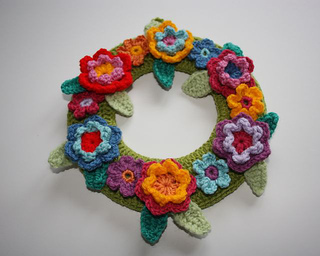 Flower Wreath by Sher Jenkins it is a cute pattern with different crochet flowers on it. Different kinds and brands of yarn have been used for this one. 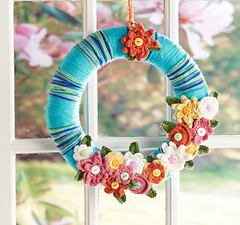 April Flowers Wreath by Sharon Mann is a beautiful flower wreath made using Aran weight yarn and a 3.75mm crochet hook. We loved the colour of this one too. 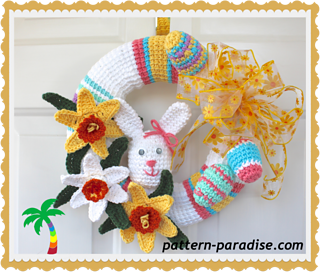 Spring Wreath PDF 14-136 by Maria Bittner looks so cute with flowers and a little bunny, you should definitely go for this crochet wreath when the spring season is on. 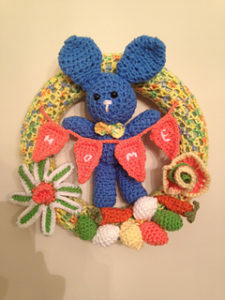 While the bunny is optional we would recommend it, because it looks different from other wreaths. Crochet Spring Wreath by Sarah Zimmerman of Repeat Crafter me is so colourful and beautiful with a little bee on it. We really loved this one, due to the light green colour and the bee of course. 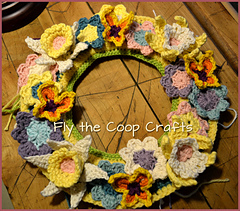 Check out the article for a link to crocheted bee and flowers which are given inside. 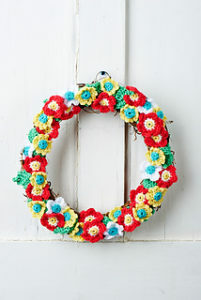 This is one of our favourite Crochet Spring Wreaths. 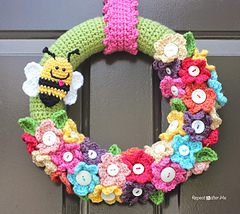 Crochet Spring Wreath by Tanya Eberhardt is another design with a bee on it. 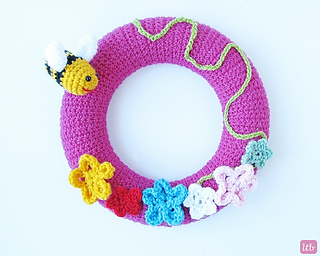 This is simple and beautiful pink wreath with an amigurumi bee that looks very cute. Yes, it looks cute because of the bee in pink background. Also, it is with less decoration compared to others so if you love simple this one is designed for you. For more such articles sign up today to be the first one to read them ? We also have lots of crochet patterns where you get many free patterns of a particular thing under one umbrella. Also, we write simple beginner patterns with photo-tutorials. Note:- All patterns and photos belong to the Designers. We do not take credits for any of these.